Girne American University (A.K.A Girne Amerikan Üniversitesi) is an American University located in Kyrenia (Girne), in the Turkish Repubic of Northern Cyprus within Cyprus. The University was founded by Mr. Serhat Akpinar in 1985. This is an American College that follows the US higher education. The university´s mission has always been to provide higher level education that is fully accredited by multiple official Accreditation institutions such as UNWTO of the United Nations, Pearson/Edexcel, The European Accreditation of Engineering by European Network for Accreditation of Engineering Education (EUR-ACE – ENAEE), The Turkish Yükseköğretim Denetleme ve Akreditasyon Kurumu (YÖDAK) and many more that can be seen in their official website. GAU is one of the most modern International American Universities in the world that has the most up to date technology and state of the art professors hailing from multiple countries in the whole world, a true international education with a true American Education. The University offers majors in Business and Economics, Politics, Health Sciences, Engineering, Communication, Humanities, Law, Pharmacy, Education, Architecture, Aviation, Marine, Nursing, Sports, Performing Arts and Tourism. In order to apply for education at GAU, the student is expected to have at least 12 years of full time education and evidence that the student has achieved satisfactory grades at high school with official certificates. The University also accepts A-level, IB , EB and/or other official certifications so long as the student´s academic performance has been above satisfactory. The grades and certificates are to be sent to GAU for evaluation to determine if the student is eligible to have a place at GAU. Students are required to have taken an official English certification exam such as IELTS or TOEFL and are expected to have minimum passes of 6.0 in IELTS and 500 in TOEFL. If the student lacks any of the above but still meets the application requirements, they will be placed on an English proficiency test within the university to determine their level of English. It is mandatory for the student to send an official health documents from their home town for GAU to be aware of any possible medical history the student may need assistance with in order to have the right care if necessary. Kyrenia is one of the safest cities one can find themselves living in. The majority of the population is Turkish Cypriots alongside Greek Cypriots. Kyrenia is a very secular city which is very typical of North Cyprus and has one of the most beautiful beaches you will find in the whole world. Turkish Cypriots are some of the most hospitable people you will ever find and it is not uncommon for one to be very curious asking about your hometown and its culture. The locals will readily answer any questions and help you if you find yourself lost in the city and will even recommend you to go to visit certain places that you might end up liking. You will also be very surprised that Northern Cyprus has its own unique wine culture and has produced some of the tastiest wines such as Aphrodite and Kantara. In overall, Kyrenia has some of the most beautiful beaches and sceneries for the tourist that likes to enjoy nature and one of the friendliest people you will find that will make your stay a lifelong experience which will remain in your heart forever. Living in Kyrenia is one of the most pleasant experiences. Cyprus is a small island and getting to know the city is one of the easiest things one will notice when setting foot in Kyrenia. 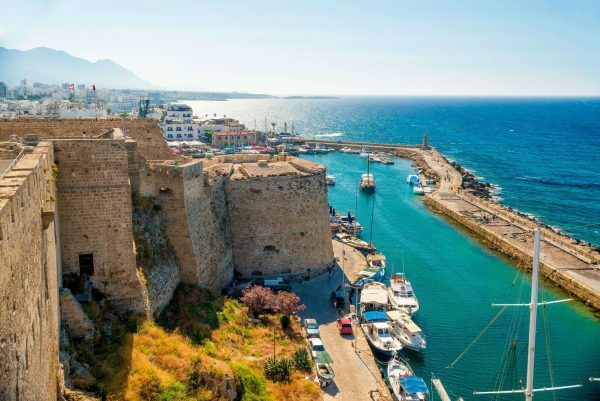 The costs of living are not as expensive and thanks to the hospitality and friendliness of the locals, one will find it rather easy to settle and feel home in Kyrenia. Kyrenia has many restaurants that are very easy to find and as those mentioned above, are often full of very tasty food and with very exhilarating atmospheres. Nightlife in Kyrenia is also very vibrant where you will find plenty of young people spending time at bars such as The Spot Bar, who serve cocktails, Cypriot Mezze dishes and even have flat screen tv´s with the option of watching soccer matches (Strangely enough, Turkish Cypriots really like soccer and enjoy watching La Liga or the Premier League). It is also funny to note that Turkish Cypriots are much more outgoing than their more conservative Turkish counterparts in the Republic of Turkey and even their southern Greek counterparts in Southern Cyprus (Republic of Cyprus). In fact, North Cyprus has a very vibrant and outgoing nightclubbing lifestyle. For example, one can find themselves at Cést La Vie nightclub that features North Cyprus´s favorite locals Dj´s who play a round of Techno, EDM, and Hip Hop depending on what venue is being currently hosted. The club opens at 9 pm and closes at 6 am like all the other clubs in Northern Cyprus. The entry prices are also not as expensive and will usually cost 5-10€ at best. When visiting Kyrenia, one should definitely see the Kyrenia Harbor. This harbor is full of boats, yachts, café´s, apartments, bars, and restaurants. This is also considered to be the city center of Kyrenia. You will find souvenir shops and local markets if you are looking for postcards, gifts, food and cooking supplies. Cypriot Turkish cuisine is one of the most unique cuisine´s you can find. The Turkish Cypriot cuisine has its influences consisting of Greek, Turkish, Persian and Arabic Cuisines. One of the tastiest dishes include grills, pastry´s, vegetable dishes, soups, fish, kebabs, sweet cakes and many more. Apart from the local cuisine you can also find international cuisine´s such as Chinese, Italian, French, Indian, British and Persian scattered around Northern Cyprus including Kyrenia. Set up and opened in April 20, 2011, this restaurant is a must go for anyone who intends to visit Kyrenia and try the local food. This restaurant is very cozy and has one of the most hospitable and friendly people who are ready to attend and serve you with kindness. You will find delicious kebabs, seafood, unique Cypriot dishes and some of the tastiest desserts out there in the whole world served with a glass of local Ayran (tasty yoghurt drink)! If Indian food is your cup of tea, then this is definitely the right stop. With some of the tastiest Tandoori and Curry, this restaurant has very satisfactory staff service and a level of hospitality that is almost unbeatable. The dishes are of great value and the location is quickly accessible by taxi, bus or car. A definite must visit! A must stop for anyone who likes Chinese food. This restaurant is near GAU university and has some of the finest Chinese and Japanese food such as sushi, noodles, sweet and sour chicken, dumplings and many more! Italian food at its best! You will find plenty of savory Italian dishes such as Penne, Bolognese spaghetti, pork loin with lemon and mustard etc. This restaurant also serves Italian wine such as Chianti and Italian Beer such as Peroni. Staff are very friendly and provide fast and efficient service which will satisfy anyone looking for a nice meal and spend a relaxing time, even non-Italian food aficionado´s.